In this series, we drill down on one company's returns to see how each of those three has played a role over the past decade. Step on up, Capital One (NYS: COF) . Capital One shares returned a net loss of 5% over the past decade. How'd they get there? Dividends softened the blow. Without dividends, shares delivered a net loss over 12% over the past 10 years. Earnings were surprisingly strong. Capital One's normalized earnings per share increased at an average rate of 9.2% a year from 2001 until today. That's impressive given the severity of the financial crisis, and the weak performance of credit card divisions at competitors Bank of America (NYS: BAC) and Citigroup (NYS: C) . Only high-quality rival American Express (NYS: AXP) delivered better earnings growth over the period. 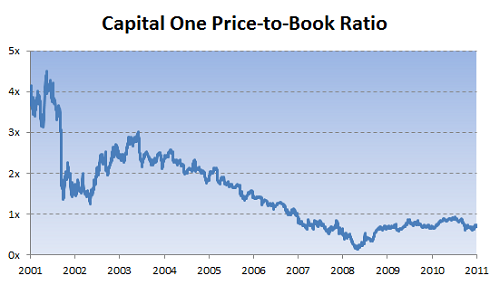 Capital One's price-to-book value has dropped off a cliff, falling by over 80% over the past 10 years. That's drowned out all of its earnings growth, and left shareholders stranded with no returns during a period when the company actually performed fairly well. In hindsight, this isn't surprising. At four times book value 10 years ago, shares were priced for absolute perfection. Buying shares at that price was practically begging for low future returns, which is exactly what shareholders received. Today, the situation is flipped. At less than one time book value, shares are priced for absolute misery. Some of that might be rational: the U.S. consumer is still weak, loan demand is down, and the outlook for the global economy is dismal. But that's exactly what investors are expecting. Over the past decade, shareholders had to deal with a strong company being held down by contracting multiples. Over the next decade, a still-decent company might be helped along by stable, or even expanding, multiples. Why is this stuff worth paying attention to? It's important to know not only how much a stock has returned, but where those returns came from. Sometimes earnings grow, but the market isn't willing to pay as much for those earnings. Sometimes earnings fall, but the market bids shares higher anyway. Sometimes both earnings and earnings multiples stay flat, but a company generates returns through dividends. Sometimes everything works together, and returns surge. Sometimes nothing works and they crash. All tell a different story about the state of a company. Not knowing why something happened can be just as dangerous as not knowing that something happened at all. Add Capital One to My Watchlist. At the time this article was published Fool contributor Morgan Housel owns B of A preferred. Follow him on Twitter @TMFHousel. The Motley Fool owns shares of Bank of America and Citigroup. Motley Fool newsletter services have recommended creating a write covered strangle position in American Express. Try any of our Foolish newsletter services free for 30 days. We Fools may not all hold the same opinions, but we all believe that considering a diverse range of insights makes us better investors. The Motley Fool has a disclosure policy.